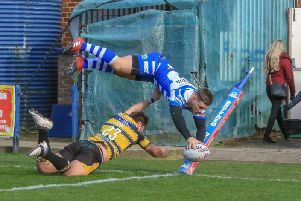 Halifax coach Richard Marshall will field his strongest possible side in the club’s third and final warm up fixture against Super League partnership club Salford at the Shay on Sunday (3.0). Fax’s pre-season form has been indifferent, with a young side losing heavily to Featherstone on Boxing Day and a second half collapse seeing Widnes run out 30-0 winners at the Halton Stadium last weekend. And with the Championship kick off just over a fortnight away, and potentially pivotal games against top four rivals Rovers and Batley in the first two rounds, Marshall is well aware the clock is ticking if his team are to hit the ground running. “I’m happy with where we are physically, but there are things we have to do better this weekend,” said Marshall. “We’ll put the best side we can on the field on Sunday and we’ve probably got something to prove, to ourselves as a group of players and coaches and to the supporters, because we’re getting written off before the season has even started. “Salford will be like any other Super League side, they’ll play the game at a different kind of pace and they’ll execute their skills better than Championship teams, so it will be a good test for us. “I want to see us show more in attack this week and see if we can score some tries. “We’ve done a lot of work on that part of our game and I was actually pretty encouraged by what we did in the opposition 20 during the first half at Widnes. “The issue was we just weren’t in that position often enough; maybe only six times in the entire game. Marshall will give the first appearances of 2017 to player-coach Simon Grix and utility player Ed Barber, while centre Ben Heaton returns and the versatile back James Woodburn-Hall could also feature if he can prove his fitness after an ankle problem. The jury remains out on who will partner captain Scott Murrell at the scrum base, with fitness doubts over Gareth Moore (hand) and Connor Robinson (calf) clouding the picture. “Gareth’s had a second X ray on his hand and there’s no fracture,” confirmed Marshall. “I’m hopeful he’ll play, but we’ll have to see how he gets through this week. “Connor got a knock on his calf at Widnes, but with any luck he’ll be okay to continue at full back. “Ben got a bang on his knee on the Thursday before Widnes, but he’ll be back this weekend and Simon will have a run and get some work under his belt. “I’d like James to play as well; realistically he probably needs to play if he wants a place in that first game against Featherstone but he also needs to get a full week’s training in first. Fax could also have Salford’s back rower Liam Bent on deck against his parent club, although this week’s news of injuries to the Red Devils’ starting pair Josh Jones and Ben Murdoch-Masila could yet impact on Marshall’s hopes of dual-registration reinforcements. “I’ll be speaking to Ian Watson this week, but yes, that could potentially impact on us,” said Marshall.